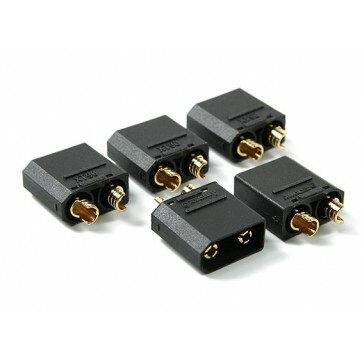 Everybody's favourite heavy-duty connector, now available in black! Made from high-temp Nylon and gold plated spring connectors, both included in the injection mould at the time when forming the connector. The XT90 ensures a solid high-amp connection, perfect for applications up to and beyond 90A constant. The XT90 offers a tight fit, ensuring a solid connection for minimal resistance. This means that more power gets from your pack to your power system when compared to other plugs currently on the market. Don't starve your high-amp power system, switch to XT90 connectors today!